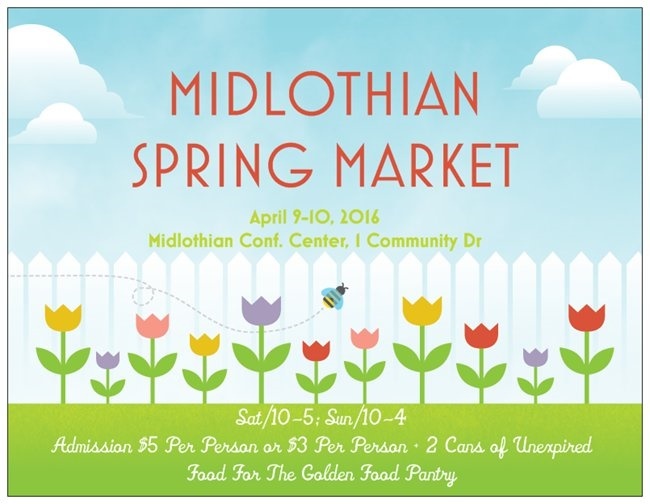 "Martin United Methodist Church in Bedford, Texas is hosting a Craft Fair, April 9, 2016 from 9:00 - 3:00. We would love to invite you to join us for a day of fun, fellowship, and shopping!" No electricity or tents provided outside. No Rain contingency plan available, no refunds. Electricity is $10, Tables are $12. Chairs provided/Free drink voucher for vendors. Applications are available here and are due by March 25, 2016. For more information, contact their event coordinator at journeymumc4@gmail.com / 817-685-0713. "FUNKY JUNK ROUNDUP is a one day shopping extravaganza featuring a unique blend of vintage finds & inspiration, one of a kind handcrafted items, antique décor, hand painted furniture, repurposed items, rusty-chippy-shabby-reloved & refunked JUNK, bling & glam boutiques, sparkly jewels and FABuLOUS JUNKTIQUES for your creative soul! Put some JUNK in your trunk™ Y’all!" Applications are available here and are due by June 23rd, 2016. For more information, visit their website or contact their event coordinator at montagefestivals@earthlink.net / 405-401-7193. 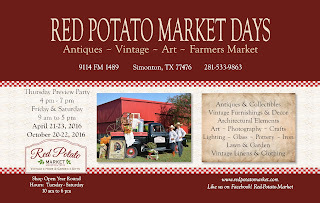 "Red Potato Market Days has over 70 vendors participating and bringing vintage, antiques and painted furniture, lighting, eclectic finds, art, jewelry, clothing, pottery and handmade soaps and crafts you will find an amazing shopping experience in a country setting just outside Houston city limits. The event takes place in a covered arena, rain or shine. Local farmers also bring fresh produce. $5 admission supports Young Life & Simonton Christian Academy. Children under 12 free. For more information call 281-533-9863. " Admission Fee: $20 for preview party on April 21; $5 admission fee on April 22 and 23 which support Young Life and Simonton Christian Academy. Children under 12 free. click below for event flyer. Applications are available here and are due by March 31, 2016. 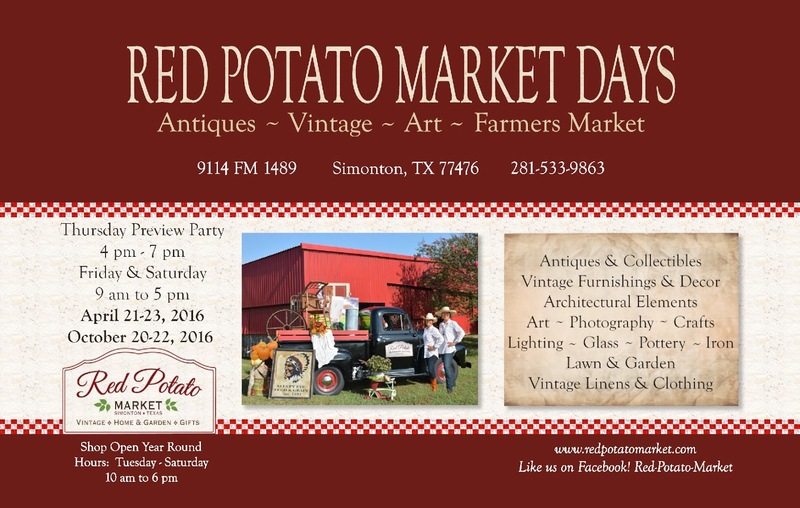 For more information, visit their website or contact their event coordinator at Redpotatomarket@att.net. Real restrooms and water available. Free weekly business mentions on Facebook and our website. For more information, visit their website, Facebook page, or contact their event coordinator at pamclothey@gmail.com. Applications are available here and are due by May 5th, 2016. "Booth after booth of great Spring finds...gifts, arts/crafts, food, and more!!! Come out and support small, local business...something for everyone in the family!!! We are proud to offer a canned food drive to benefit Midlothian's Manna House and the Golden Food Pantry located in Golden, TX. The SPCA is scheduled to be out offering pet adoptions. " Admission is $5 per person or $3 per person and 2 cans of unexpired food. Kids 12 and under are free with paid adult. 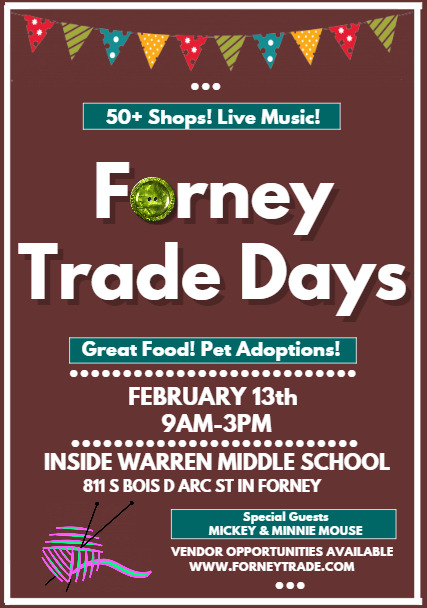 Free bounce house for the kids and area pet adoption groups will be out!! Free wi-fi, parking, includes one 6 ft table and two chairs. Electric is free, but limited availability. Applications are available here and are due by April 1st, 2016. "Indoor and outdoor booths filled with handmade items, unique gifts and gadgets...something for everyone in the family!!! Free bounce house for the kids. First 50 shoppers each day will receive a free swag bag!" Admission Fee: Admission is $7 per person or $5 per person and 2+ cans of food for the Golden Food Pantry. Kids 12 & under are free with paid adult. Free parking, electric is free but very limited. Applications are available here and are due by March 30, 2016. "Spring Arts & Craft Fair to be held at First Baptist Church of Sachse, April 30th from 9am to 4pm. Proceeds benefit Kenya missions and orphans." All vendors will be required to donate a item in value of $25.00 for silent auction. Vendor will need to provide their own tables and chairs. Applications are available here and are due by April 01, 2016. For more information, contact their event coordinator at debbie@compeloutreach.org / Stephanie at stephanie@compeloutreach.org / 972-442-4747. "Booth after booth of gifts, original art, crafts and more!!! First 50 shoppers through the door each day will receive a ""swag bag"" and one lucky shopper will win the ""Super Swag Bag!!!" Free wi-fi and parking. Electric is free, but must be requested. Applications are available here and are due by March 18, 2016. "Annual Spring Arts & Crafts Show for Northeast Tarrant County, located in Hurst." Booths are 8 X 10 and cost $75. $15 electricity fee if needed for items sold. Applications are available here and are due by April 07, 2016. "Two days, and over 100 exhibitors, all for your enjoyment! This years expo will be held in Lewisville, TX on July 30th & 31st, 2016 from 9am to 8 pm Saturday, and 10am-6pm Sunday at the Premier Event Center. From world class food, fashion, to fabulous makeovers. . .the Expo isn't just an event, it's an experience! There will be shopping, beauty, full body rejuvenation, health, nutrition, fitness, financial planning, home decor, and more. Enjoy an amazing makeover, styling, and a mini-manicure, as well as refreshments and snacks!" You can pay in full or pay half when registering and the other half in 60 days. They are 3/4 of the way full. Booth price includes electricity, you may bring your own tables and chairs or rent them. Fee also includes logo on website, exhibitors list, mentions on Facebook and 2 free event shirts. Applications are available here and are due by May 30th, 2016. For more information, visit their website or contact their event coordinator at beautimousexpo@gmail.com / 214-772-8686. Applications are available here and are due by April 5th, 2016. "Wisteria Street Market is a day of family friendly shopping and activities. There will be arts + crafts vendors, food trucks, a face painter, silent raffle, art area, free make + take crafts, and various activities throughout the day. Our silent raffle will benefit Keep Mansfield Beautiful. Don't forget to check out the Police Departments Meet and Greet also being held at City Hall from 10am-2pm. The first 100 guests to Wisteria Street Market will receive a giveaway!" This fee includes 2 chairs with each booth and Vendor Hospitality Room with snacks. Applications are available here and are due by March 26, 2016. For more information, visit their website or contact their event coordinator at mary.jones@mansfieldtexas.gov. 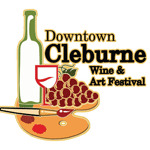 "The Cleburne wine festival will have wine vendors, food trucks, live music and vendors from noon to 8 at our beautiful down town market square. We have been doing this for many years now. The event is free with the option to purchase wine tasting packages." Downtown Market Square in Cleburne. There are no address numbers anywhere posted. Its just downtown . About 3 blocks down on the right hand side from the courthouse. Admission Fee: The event is free with the option to purchase wine tasting tickets for $20.00. This gives you a commemorative glass and 10 tastings from the wineries. Booths are 10 by 10 and cost $75. You must bring your own table, chairs, and tents if you want. Applications are available here and are due by August 01, 2016. For more information, visit their website or contact their event coordinator at wine@thecleburnewinefestival.com / Tracy at 214-402-3597. "This handmade-only show will feature over 70 of the finest artisans and crafters in the area. Rockwall HS choir will be providing singing, entertainment, and concessions.With free parking and only $2 admission you wont want to miss it. So grab your friends and make a day of it." This fee includes 1- 6' table and 2 chairs and free Wi-Fi. Additional 6' tables are $10 each. Electricity is $10 each and is limited. Applications are available here and are due by March 15th, 2016. For more information, visit their website or contact their event coordinator at theatticdoorstudios@yahoo.com / 206-354-2735/ 972-863-2393. 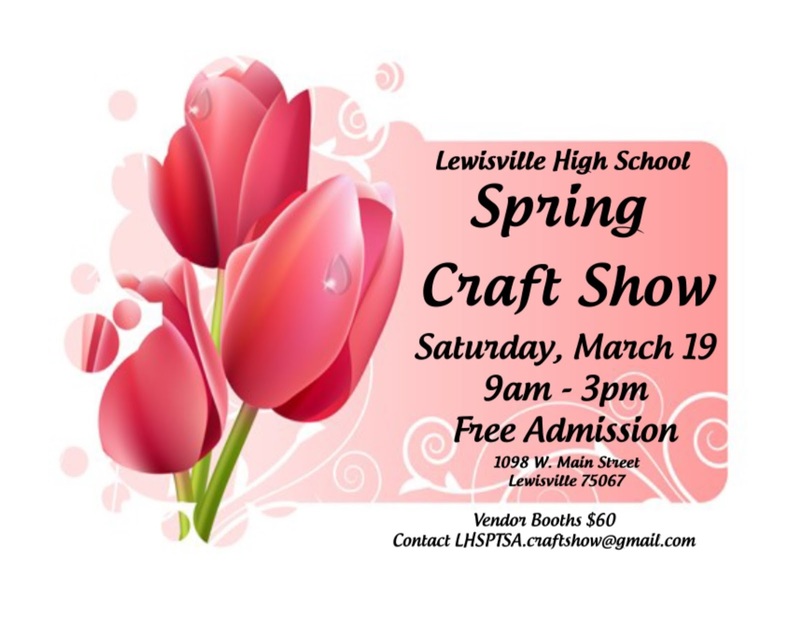 "Annual Spring Craft Show held at Lewisville High School. The event typically has 65-70 different vendors representing all types of crafts and direct sales companies. The event will be held Saturday March 19, 2016 9am-3pm and is free to the general public." 1-4 Chairs can be provided per booth. Electricity is available but on a limited basis; vendors are responsible for tables and extension cords. There will be volunteers available at the event to help set up/break down the booths. Applications are available here and are due ASAP. Booth assignments will be made after March 12, 2016. For more information, contact their event coordinator at LHSPTSA.craftshow@gmail.com. "Come check out our monthly INDOOR event with over 50 vendors - crafters, wood workers, jewelry makers, boutiques, reps from your favorite companies and more!-, live music, and special guests Mickey & Minnie Mouse! FREE ADMISSION & FREE PARKING!" "The Total Woman conference is tailored to women of all ages and races. Our goal is to impart the importance of women discovering who they are and walking it out." Vendors provide their own tents and supplies. No electricity provided. First Come first served basis. Booth space will fill up quickly. Applications are available here and are due by June 10, 2016. 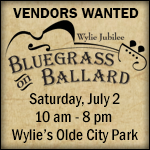 For more information, visit their website or contact their event coordinator at carole.ehrlich@wylietexas.gov / craig.kelly@wylietexas.gov. This fee includes free electricity. Applications are available here and are due by March, 10th 2016. Applications are available here and are due by March 1st, 2016. Booth sizes vary are cost $35. This is an outside event so booth sizes will vary. Each vendor will have approx 6-8 ft. They can accommodate more if needed. Canopies are welcomed. Spots are exclusive! Applications are available here and are due by March 23rd, 2016. For more information, visit their website or contact their event coordinator at Dana at PGNANewsletter@gmail.com.